While we look forward to the comfort of a relaxing weekend or vacation, many of our favorite memories involve going a little (or a lot) beyond previous comfort zone. Thinking back on fond memories of pivotal points in your life, chances are pretty good that whether you started a new business, learned a new skill, or changed your family status--much of the joy you feel when remembering these special times comes from the recollection of a moment when you made a daring move and ventured forth in the direction of your dreams. There is some kind of genius and magic in taking action fearlessly, as often courage comes forth as your words and actions take you farther forward to become the larger, more confident person you’d most like to become. You can tell the difference between living a life in which you are fired up to be and do your best, compared with just getting by from day to day. People who are just getting by are shuffling along on autopilot, focused on maintaining the status quo and keeping whatever levels of comfort they’ve acquired. People who are living large are easy to spot, since they’re the ones who are bounding enthusiastically forward, learning new things, meeting new people, and taking risks with every new thing they try. Their enthusiasm is infectious, and often it comes from their knowing that it’s a whole lot easier to gain momentum when you are moving forward to being and doing what you most love to be and do. Or in this case, a single quantum jump! This has been an exciting month, with an announcement from physicists studying Cosmic Microwave Background (CMB) radiation at the south pole that for the first time, clear evidence can be seen of super-fast expansion and inflation of our universe immediately following the Big Bang. I cover this news in the blog post, Big Bang Waves Suggest We Live in a Multiverse, and I have another blog post covering more multiverse news, Biocentrism: What if Life Selected this Universe? I hope you check out both these blog posts and the YouTube videos I created for each of them, and leave comments and questions if you feel so inspired! 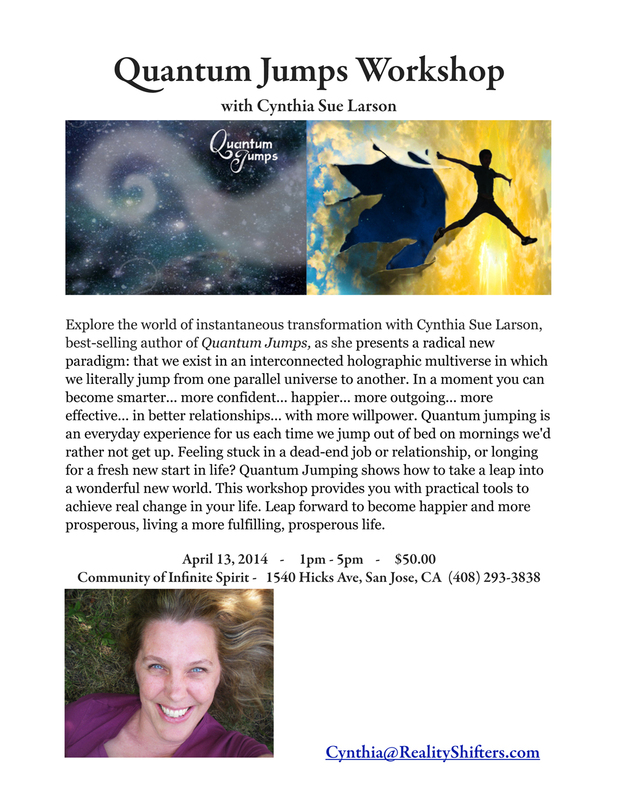 "All Things Connected" radio show host Dr. Julie Krull interviews Cynthia Sue Larson, best-selling author of "Quantum Jumps," exploring the absolutely amazing science of how we move between parallel worlds of possibility in a holographic multiverse. If you've heard news reports of big discoveries related to the Big Bang and don't know what to make of it, or why it should matter, you may be amazed to find that scientists have made one of the biggest discoveries about the beginning and nature of our universe--confirming that our universe began from something very, very small, and there was rapid inflation that left its mark in the form of gravitational waves. Recent findings by physicists working with data from observations of cosmic microwave background (CMB) radiation at the time of the Big Bang suggest that our universe experienced a time of extraordinarily rapid expansion called inflation... which in turn provides support for the idea that new "pocket universes" can be formed. The basic idea of inflation is that spacetime is physically infinite... a fabric stretched out farther than we can fully imagine. Even more amazingly, the notion of "eternal inflation" predicts there will be an infinite number of Big Bang universes separate and distinct from ours, bursting forth endlessly from an underlying matrix. While most other Big Bang universes are likely to be quite different from ours, parallel universes are now viewed to be more than just a theory, and in fact predictions of particular theories. This new research is generating tremendous excitement based on data collected by the BICEP2telescope in Antarctica, where scientists have been searching for evidence of a particular type of polarization existing in the cosmic radiation found everywhere in our universe after the Big Bang. BICEP stands for “Background Imaging of Cosmic Extragalactic Polarization,” and the BICEP2 telescope is the second version of this research device. Scientists working with BICEP and BICEP2 have found primordial b-mode gravitational waves, indicating that light was polarized by existence of uniformly distributed influence of gravity on light from a time period of 380,000 years after the Big Bang. Have you ever looked up at the night sky, sparkling with shining stars, and marveled how it can be possible that we live on a planet that revolves around a sun that looks like just another twinkling star when seen from afar? When you stop to really think about it, it's truly mind-bogglingly amazing that we're alive on this planet that has just enough water and air and is just the right temperature to support our form of life. I just read Robert Lanza's thought-provoking book, Biocentrism, which raises the question of how our universe developed in such a way that it is perfect to support life. The odds against such a thing happening purely by chance are astronomically high. The concept of "fine-tuning" has been utilized in the past as an argument in favor of the existence of God, based on the notion that because fundamental physical constants are perfectly positioned to support life, some organizing effect behind the scenes must be going on to have created such a remarkably unlikely situation. We tend to assume that chaos is the order of the day, as most of us are familiar with in our daily lives. We don’t expect our homes and gardens to tidy and organize themselves, but rather we come to learn that order takes effort, whereas chaos naturally unfolds. So taking a long, hard look at just how organized our universe seems to be leads us to wonder how, exactly, we ended up on a planet that happens to be just the right distance from our sun in a universe that naturally tends to be supportive of life. Lanza asserts, as the subtitle of his book Biocentrism states, that life and consciousness are the keys to understanding the true nature of the universe. Just how this occurs, Lanza says, has much to do with the extraordinary effects consciousness has been proven to have in the quantum realm. Since experiments conducted in quantum physics have determined that human observers influence behavior of quantum particles in such a manner that results can be shown of a decision before it is made, Lanza suggests this indicates that life itself is the deciding factor in the “Goldilock’s Universe” we find ourselves living in. I’d like to share last nights quantum jump. This was my second jump; the first jump was more sublime and lasted for four hours, and then I jumped back. Last night was a total change, and the jump really gave me evidence and showed itself. I was sitting in the sofa and I had written to a friend on my iPhone, and he replied. His reply was long, so I scrolled down to get a over shot on how long the reply was, and it was something like 4 inches, so I scrolled back up and started reading. After 1/3 an alarm went off in the kitchen, and my girlfriend asked me to go look. I went out to the kitchen and started looking for what was making the sound. I found a meat temperature thermometer, and picked it up. It said 16.00.00, and then went back to 00:00:00 like a reboot. So I turned off the device and put it back. I returned to the sofa and picked up the iPhone and now the message was no longer there; the reply I got now was two very short replies and was sent to me at 20:20 (24h time here). I was very excited when I see this, because I have worked for some time to get this to really manifest. My first response was to find something more that has changed, and I looked at my bank account with the intention that I now had more money. And my dream came true--there was about 200 dollars more on the account, and I started to laugh. I checked to see what this change of money was, and the only thing the account is saying is TAX. And this make me laugh even more. TAX is something that I see as a negative thing, and usually they take money but not this time... hehe :) I will be looking fore more changes today, and life is starting to get better. It’s fun to be a deliberate creator. Feel free to share this story if you like, because I will be jumping parallel realities on a regular basic from now on. 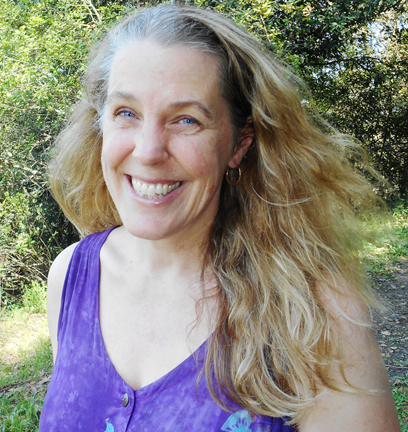 Note from Cynthia: I'm so glad to see how much fun you're having with experiencing jumps to other realities where you see real evidence that you've jumped into a new reality both in terms of seeing different messages on your phone, and also looking to see that you now have more money--from TAX, no less! Thanks so much for sharing this experience! since the last time we talked I have had one very noticeable shift. This shift has happened in the library. There is a big window that looks out to the parking lot and a street. But after I shift to the another reality, there were 3 brown ceiling to ground poles right in front of the window! I know 100% that was not there. I walked by that window every time I went there, and I go there often. At lease once a month and have been since 2012. So now I know this is solid proof that these timelines exist and I decided to try to shift back to my original world. I have thought to myself, if this can happen I can shift back. So I try, but i'm not getting success. I had gone through the same process that got me here but no success. It maybe because I don't think 100% that things can return, but I know pretty well that it can and I have had things return. So I can't shake this belief off that maybe hindering me from returning. So any help you can offer will be great. Secondly, there is another person that every time I shift to another reality they always seem to follow and have my thoughts of the other world? I recently pointed the library thing out and that person was shocked? I don't have any explanation why this would happen? Maybe you heard something similar? Thanks a lot! Note from Cynthia: Thank you for sharing this experience of noticing you are in a reality which now has three ceiling-to-ground poles where none existed before. After ruling out the possibility of someone doing remodeling or construction, I'd recommend relaxing with regard to focusing so much on returning to a reality where the poles are gone. For one thing, a relaxed attitude is more conducive to experiencing reality shifts, and for another, there is a possibility that other aspects in your reality-with-the-poles are preferable to you for reasons you may not know or appreciate. With respect to someone often experiencing and remembering realities you also recall from alternate histories, this often happens with people you are entangled with--with people you care about and feel a sense of shared connection. I prefer to know other people also remember some of the same alternate histories I recall, and sometimes you can feel a huge sense of relief that you're not the only one remembering things used to be different! 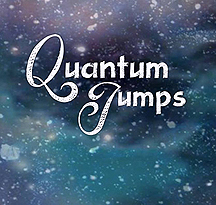 Thank you so much for writing to me and letting me know you're studying quantum jumping. 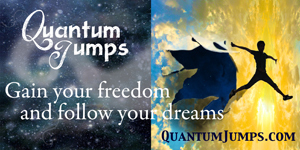 You can definitely quantum jump with zen music or music of bells or nature! I came across your post about changing the past. However, I am interested in actually living life again from a chosen day, month and year. Do you have any information on this? Your answer will be appreciated. As there are no limits with LOA, how about living your life again from any time you wish. For example, i visualize myself waking up in the day, month and year (and other detail, making it as real as possible also with lots of emotion) I choose until my subconscious accepts it, and I have no doubts against it, I'm sure that would happen. Does you know anything about this subject? I look forward to your reply. I just watched your interview with Danna Wilberg. Quantum effects definitely occur on a macro scale. I know this goes against the mainstream's academic's opinion. But, their investigation into the matter is obviously affected by their culturally defined view point. Similarly with 'reality jumping'. It's nice to see other people's personal observation of this awareness. As solid, incontrovertible scientific evidence builds describing increasing examples of macroscopic quantum processes, the consensus view of what is possible will gradually change. Thanks for your support, and for discussing these topics with others to help increase awareness of new research and views of reality and our world! It's not often that one finds a business success book written by a self-made millionaire who is so humble, funny, and down-to-Earth. James Cusumano's book BALANCE provides a unique perspective on building inspired business from your passions and interest in such a way that helps ensure prosperity and growth---for you AND your business. The subtitle of this book is "The Business-Life Connection," but it might just as well have been, "Finding Success by Following Your True Passions in Life." One of the fascinating threads running through this autobiography is that each time Cusumano sets and reaches a goal, he creates a new goal so he can continue on. The eldest of ten children of American immigrant parents from Italy, Cusumano quickly discovered the power, genius and magic of boldness in taking active steps forward in pursuit of his dreams. Young Cusumano dove into learning to play piano with help from an Army buddy friend of his Dad's as a self-proclaimed "student-in-a-hurry-with-a-mission." Cusumano was in a hurry to play music for school dances, but that dream was quickly eclipsed by bigger dreams of playing 50's rock and roll, since after three years of lessons he was singing lead vocals and playing keyboard in a friend's band. Not only did Cusumano spring to national fame and attention as a musician in the group Royal Teens of "Short Shorts" fame, but he went on to get a PhD in physical chemistry, and then launched his own successful Silicon Valley start-up company. From there, Cusumano made a feature film, and is currently running a boutique chateau hotel in Prague, Czech Republic. What makes Cusumano's point of view so inspirational to me is the way he shares such a fascinating behind-the-scenes account of his history of interests in things that start out seeming innocuous, but end up being extraordinarily important. While some kids play with chemistry sets, most don't end up making household cleaning products for their neighborhood. This recurring theme of making the most of everything we've got runs deeply through BALANCE to the point that by the end of the book when Cusumano describes how he bought a castle, such a thing seems completely natural. This self-made wunderkind's book becomes more than mere autobiography in the remaining majority of the book in which Cusumano offers keys to creating a fulfilling life and building a successful business. While Cusumano is a big fan of writing goals down on paper in order to best follow through, he also gives a great deal of credit for his success to some less measurable factors as authenticity, honesty, compassion, commitment and trust. My favorite part of BALANCE, where the value and message shine brightest, comes from describing Cusumano's keys to inspired leadership. In this section Cusumano shares best business practices for ensuring your business gets and stays focused on service. BALANCE really shines brightest when focused on describing ways to help you and your business grow, and Cusumano sets an excellent example of how it can be possible to make your dreams come true. 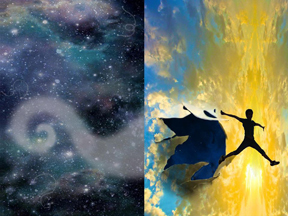 What if Life Selected this Universe? Robert Lanza's thought-provoking book, BIOCENTRISM, raises the question of how our universe developed in such a way that it is perfect to support life. The odds against such a thing happening purely by chance are astronomically high. The concept of "fine-tuning" has been utilized in the past as an argument in favor of the existence of God, based on the notion that because fundamental physical constants are perfectly positioned to support life, some organizing effect behind the scenes must be going on to have created such a remarkably unlikely situation. We tend to assume that chaos is the order of the day, as most of us are familiar with in our daily lives. We don't expect our homes and gardens to tidy and organize themselves, but rather we come to learn that order takes effort, whereas chaos naturally unfolds. So taking a long, hard look at just how organized our universe seems to be leads us to wonder how, exactly, we ended up on a planet that happens to be just the right distance from our sun in a universe that naturally tends to be supportive of life. Lanza asserts, as the subtitle of his book BIOCENTRISM states, that life and consciousness are the keys to understanding the true nature of the universe. Just how this occurs, Lanza says, has much to do with the extraordinary effects consciousness has been proven to have in the quantum realm. Since experiments conducted in quantum physics have determined that human observers influence behavior of quantum particles in such a manner that results can be shown of a decision before it is made, Lanza suggests this indicates that life itself is the deciding factor in the "Goldilock's Universe" we find ourselves living in. The word "biocentrism" was originally intended to convey a sense of reverence for all life, as opposed to focusing primarily on human life, and Lanza's definition has taken that meaning a bit farther to suggest that biological consciousness is the fundamental consciousness at work in providing us with this particular universe. While I respect Lanza's premise that there exists sufficient evidence supporting the tremendous connection between microscopic quantum descriptions of reality and macroscopic classical reality, it seems clear to me that consciousness must be more than merely biological or bio-centric. While it's true that we likely do experience the most biologically friendly universes in the multiverse of all possible realities, consciousness itself extends beyond our ability to fully comprehend it, and is worthy of a 'centrism' of its own in terms of being the ultimate creative force in establishing physical reality. I at times enjoyed and at other times felt annoyed by Lanza's style of writing, which ranges from playful to verging on arrogant. I'd love to feel Lanza was sharing more of his authentic, deeper feelings when describing, for example, what must have been a devastating blow as his sister slipped into a state of losing touch with her sense of reality. On the positive side, Lanza's breezy writing style makes this book about fairly heavy topics easy to read... so this book delving into physics, neuroscience, and the nature of reality is something you can sit down and read in a weekend. I am enthusiastically supportive of Lanza's premise in BIOCENTRISM that consciousness is at the center of creating the physical world. Highly recommended! Over 7,400 RealityShifters Subscribers live in 84 different countries around the world -- with the majority in the United States of America, Canada, the United Kingdom, Australia, Africa, New Zealand, India, the Netherlands, Malaysia, Mexico, Italy, Sweden, Germany, Brazil, Belgium, Singapore, South Africa, the Philippines, Japan, Norway, Ireland, Denmark, Spain, Israel, and Panama.